In remaking an ax, in restoring a house, we carry the fire of the original spirit. We commit anew, plant, put our hands to touch the work of a craftsman hundreds of years gone, and then once again feeling that work, pick it up again. And therein lie renewal and hope.” —from The Same Ax, Twice. Moving easily between meditative reflection and compelling insights, Mansfield offers lively descriptions of some of the extraordinary people who are imaginatively, lovingly, sometimes obsessively, realizing their own visions of the restorative impulse. Mansfield immerses himself deeply in the search for restoration. He travels with Civil War reenactors to help recreate the Battle of Antietam; he enrolls in auctioneer school to observe the endless recycling of artifacts, and he compares the process to the sterile preservation of these same objects in displays and museums; he observes the ongoing work of preserving the USS Constitution, “Old Ironsides,” a ship which has been replaced over the years board by board. The act of restoration, Mansfield concludes, whether it’s rebuilding antique engines or reviving the village model of community organization, must contain an element of renewal. Rejecting the sentimentality of nostalgia and the superficiality of commercial images, Mansfield argues for an understanding of restoration that is as much concerned with the future as it is with the past, that preserves and communicates a spirit as well as a form. 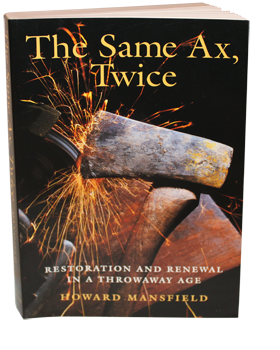 "The Same Ax, Twice is filled with insight and eloquence… a memorable, readable, brilliant book on an important subject. It is a book filled with quotable wisdom."